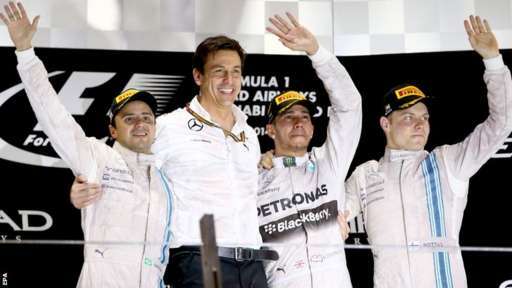 Home » Formula One: Lewis Hamilton claims world championship with Abu Dhabi win! 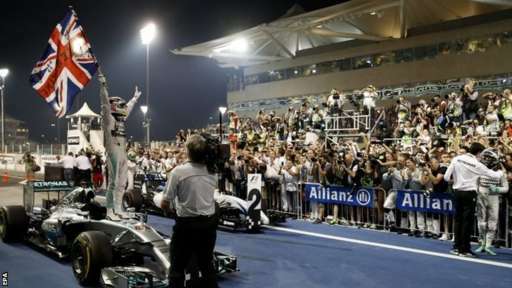 Lewis Hamilton has won the 2014 Abu Dhabi Grand Prix and with it the Formula One drivers’ championship after Nico Rosberg suffered with mechanical issues and fell from 2nd to 14th in the second half of the race. Rosberg was 2 seconds behind the Brit after losing the lead at turn 1, but a combination of multiple problems developed on his car which saw him fall out of the points and out of contention for the title. The win wasn’t as simple as Lewis might have thought heading into the final few laps. Felipe Massa had the faster tyre compound fitted to his Williams in order to give chase to the man who he had fought for the 2008 title. He closed to within 3 seconds after being 11 seconds behind, but had to settle for 2nd ahead of team-mate Valtteri Bottas. Jenson Button finished what is possibly his last ever race in 5th. Sebastian Vettel and Fernando Alonso finished their final races for their current teams in 8th and 9th respectively. 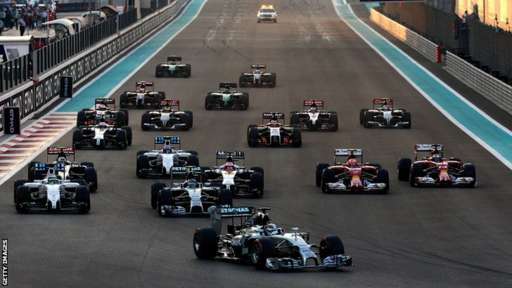 The 2014 Formula One world championship was at it’s final race. The double points, championship deciding Abu Dhabi Grand Prix. Lewis Hamilton or Nico Rosberg would take the drivers’ championship either 55 laps of racing. Also up for grabs was 4th in the standings between Sebastian Vettel, Fernando Alonso and Valtteri Bottas. As the drivers left the grid, Hamilton had complained that his practice start from the 2nd grid slot wasn’t all that he had hoped for. However as the lights went out, Hamilton had a perfect start and vaulted past pole-sitter and title rival Nico Rosberg as they went into turn 1. Felipe Massa had a lightning start from 4th on the grid and briefly tried around the outside of Rosberg but had to settle behind him in 3rd. Team-mate Bottas had an awful start and fell from 3rd to 7th before being demoted further by a move up the inside from Daniil Kvyat. The degradation of the super soft tyres led to the first pit-stops occurring very early, as had been the case in the last Grand Prix at Brazil. Fernando Alonso was the first man to come into the pits having just passed team-mate Raikkonen with the help of DRS into turn 11. He emerged from his stop behind Will Stevens in the Caterham, who was in his first Formula One Grand Prix. Alonso emerged ahead of those he was battling with but couldn’t get by the Caterham as quickly as he thought. The British driver kept him behind into the hairpin, with Alonso drawing alongside with DRS. The Caterham briefly came back in front, but he had to let him by under braking. The leading cars didn’t pit until a few laps later, with Hamilton coming in on lap 10. 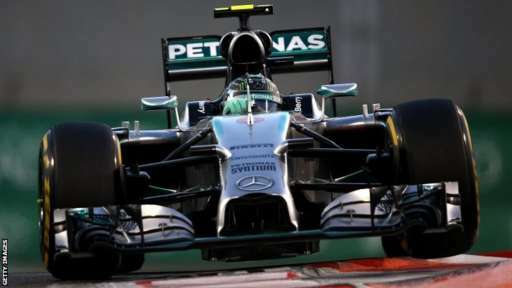 Rosberg had a slightly slow in-lap and emerged from his stop 3 seconds behind his team-mate. The plan for Nico was to extend this middle stint so that he could run the faster compound at the end of the race in the hopes of catching his team-mate. He set the fastest lap and started to maintain the gap at 2.5 seconds. Both Red Bull drivers had been excluded from qualifying and had to start from the pit-lane. Daniel Ricciardo was making the best of it of the two RBR drivers, with neither electing to pit until later on after starting on the longer lasting rubber. Ricciardo was stuck behind former Toro Rosso team-mate Jean-Eric Vergne as he tried a gutsy move, feigning going to the outside before trying to squeeze it up the inside. It worked briefly as he got by through the turn 12 chicane, but Vergne fought back into the next turn to re-take it. Ricciardo finally got it done on the next lap at the same turn. Back at the front, Rosberg was still sitting just over 2.5 seconds behind Hamilton. On lap 23 however, Rosberg seemed to lock up into the Yas Hotel section at turn 17. He fell back to 3.9 seconds as you would expect, but 2 laps later he had falled down to 7.1 seconds. Rosberg was reporting that he was losing power. The team told him that his ERS had failed. To make matters worse, Felipe Massa was closing in massively for Williams. The Brazilian got past Rosberg on lap 27 as the team desperately tried to fix the car. Pastor Maldonado’s season finale quite literally went up in flames. The Lotus driver had flames emitting from his exhaust as he approached the final two turns. He pulled the car off just before the pit entry which prevented the safety car being deployed. Lewis Hamilton nevertheless decided to pit just in case on lap 31. A clean stop got him out just behind Nico Rosberg, who was continuing to struggle with his sick car. Hamilton re-passed him easily with DRS to get into 2nd place, with Massa yet to stop for a final time. Rosberg made his final stop on lap 35 and was informed that he would have to manually get the car rolling afterwards. He managed to do and emerged down in 7th. A number of drivers ahead of him still needed to stop for a final time, including the two Red Bull cars. Rosberg was told that his crucial 5th place, which would give him the title should Hamilton retire, was still possible, but with his lack of pace it seemed unlikely. By lap 39 of 55 he was lapping slower than everybody else on track and was looking as though the title was slipping away. With Rosberg seemingly out of it, Hamilton’s attentions turned to the car ahead of him, Felipe Massa. Massa had still yet to pit with almost 15 laps to go and it looked likely that he would bolt on the faster super soft tyres to try and chase down Lewis in the closing stages. Felipe finally pitted at the end of lap 43 and rejoined in 2nd place with 11 seconds between him and leader Lewis. It didn’t take more than 2 laps before he had the fastest lap of the race and was just 8.3 seconds behind with just 10 laps to go. Surely if he got to the back of Hamilton, the Mercedes would have to let him through so he didn’t risk losing the championship. Massa now had every chance to take his first win since losing the 2008 title at Interlargos. With just a few laps remaining in the race, Rosberg started to tumble through the field. Hulkenberg, Perez, Vettel and Alonso all passed the Mercedes driver within quick succession and soon he found himself out of the points paying positions. Mercedes radioed him and gave him the opportunity to end the race early with 3 laps remaining, but Rosberg wished to cross the line, which is what he did. The tension at the front of the field was getting larger and larger as the lap count ticked down. Massa was closing in all the time, but his charge seemed to lose momentum as the final laps went by. Hamilton had put in two fastest laps of the race in the final stint and then asked the team not to do anything different with the car to make sure nothing went wrong. He started the final lap with 3.3 seconds in hand over Massa, which would be too much for the Williams driver to beat. Lewis crossed the line to not only take his 3rd win at the Yas Marina Circuit, but to take his 2nd Formula One drivers championship. His win was also Mercedes’ 16th win of the season, breaking the record for number of race wins for a team in one year. Lewis celebrated by performing some donuts with the British flag in his hand on the way back to the pits. Felipe Massa took 2nd place, his 3rd podium of the year and his 2nd in succession. With team-mate Valtteri Bottas rallying from a poor start to take 3rd, Williams were confirmed in 3rd place in the constructors’ championship, a massive improvement for a team who finished the season last year with just 5 points in 9th place. Daniel Ricciardo drove an excellent race to take 4th after starting from the pit-lane. Jenson Button took a brilliant 5th to secure McLaren in 5th place in the constructors’ championship ahead of Force India. The 2009 world champion still is unsure if he will be in Formula One with McLaren or in the World Endurance Championship. He knows that he has done all he can to prove to Ron Dennis that he deserves to be with the team next year, most likely alongside Fernando Alonso. Nico Hulkenberg and Sergio Perez gave Force India a double points finish at the final race in the season in 6th and 7th place. Sebastian Vettel and Fernando Alonso, both taking part in their final races for Red Bull and Ferrari respectively, finished in 8th and 9th and will each be hoping for a better season next year after not reaching the top step of the podium at all in 2014. Kimi Raikkonen capped off a highly disappointing first year back with Ferrari with the final points paying position in 10th place. Nico Rosberg ended his race in 13th place after having his hopes at beating Hamilton to the title taken away from him. He would later admit that even without the mechanical problems he wouldn’t have been able to beat Lewis, before vowing to come back stronger next year. Only 3 drivers failed to finish the race. Daniil Kvyat retired early on in his last race with Toro Rosso before moving up to Red Bull. Pastor Maldonado joined him following his fire, with Kamui Kobayashi the final unfortunate retirement in the returning Caterham. His team-mate Will Stevens managed to bring smiles to the Caterham mechanics and sponsors by finishing the race as the final runner. Retirements: Kamui Kobayashi, Pastor Maldonado and Daniil Kvyat.